1. The local board will pass a motion to withdraw from the Church of the United Brethren in Christ, USA. 2. The board will send a letter to the bishop notifying him of the church’s desire, along with the wording of any relevant motions passed. 3. The bishop will assign the cluster leader or another elder to chair a specially called meeting of members of the church to determine if withdrawal is the will of the two-thirds of the members present at that meeting. Members will vote by ballot to affirm or not affirm the motion to withdrawal previously made by the local board. 4. If the bishop or his designated representative determines that two-thirds of the members present vote to withdraw from the Church of the United Brethren in Christ, USA, the congregation will be considered withdrawn as of a date agreed upon with the local board. 5. If less than two-thirds of the members present vote to withdraw, the matter will be referred back to the local board. a. Exemption from tax payments to state and federal authorities. Any contributions made to the church, such as tithes and offerings, cannot be claimed as charitable deductions. b. The filing of certain tax forms. c. Real estate tax exemption. d. U. S. Postal Service bulk mailing permits. e. The receipt of many forms of grants and bequests. f. Granting housing allowance to ministers. 2. These advantages will be gone until the church attaches itself to another non-profit group or establishes its own 501c(3) status. 3. Legal and other services will be needed to secure new 501(c)(3) status. 1. Ministerial licenses and ordinations will no longer be valid as of the withdrawal date. 2. 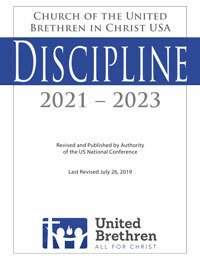 Any members of the church who are licensed United Brethren ministers must surrender their credentials or transfer their membership to another United Brethren church. 3. Ministers may be unable to perform certain duties, such as weddings, depending on local or state laws. 4. Ministers will not qualify for housing allowance unless they are under the umbrella of a group with a federal 501(c)(3) status. 5. All participants in the denomination’s retirement program will be terminated from that program according to its requirements. Some current retirement benefits could be lost or affected. 1. The church will be on its own when it comes to securing a new senior pastor. 2. Members who are attending Huntington University may lose grants that go to UB members and UB churches. 3. A congregation which ceases to be a United Brethren church will need to revise its corporate status. This may require filing new articles of incorporation and bylaws. 4. The United Brethren name is to be removed from all signs and documents following the withdrawal, reflecting the lack of association with the denomination.